The route of the annual week-long event ride for amateur cyclists was announced today. In 2012, 6 days of riding, with one rest day, will take cyclists over 462 miles in a large loop through northern Colorado and southern Wyoming. This is the first time in the 16 year history of the event that Bicycle Tour of Colorado (known as BTC) will journey into Wyoming. June 18 Monday DAY 2 Laramie to Saratoga, WY 6,792', 81 miles, (profile). June 19 Tuesday DAY 3 Saratoga to Craig, CO 6,186', 111 miles, (profile). June 20 Wednesday DAY 4 Craig to Steamboat Springs 6,728', 44 miles, (profile). 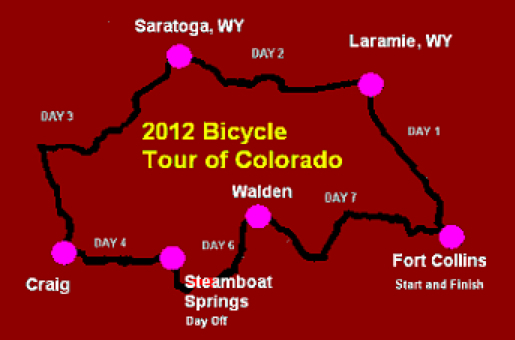 June 22 Friday DAY 6 Steamboat Springs to Walden 8,153', 60 miles, (profile). June 23 Saturday DAY 7 Walden to Fort Collins 5003', 99 miles, (profile). Registration information. The cost to register for the week-long event is $380 (this month - the rate increases $5 every month, and is usually available up to a month before the event dates June 17-23, 2012). Visit the official Bicycle Tour of Colorado website for more information on camping or hotels. *Note: this is not the professional race USA PRO Cycling Challenge to be held August 20-26, 2012 in Colorado.